Fear the Walking Dead Season 4 Episode 15 Recap: "I Lose People"
AMC’s Fear the Walking Dead season four episode 14 left off with Jim (Aaron Stanford) bit and Morgan (Lennie James) questioning his own judgement and ability to lead. Elsewhere, Charlie (Alexa Nisenson) and Alicia (Alycia Debnam-Carey) stumbled upon the flooded road by John and Strand on their search for a beach. Season four episode 15 begins with Sarah (Mo Collins), Wendell (Daryl Mitchell), Luciana (Danay Garcia), Jim, Morgan, and June (Jenna Elfman) stuck on the roof of the hospital. June tries to raise Al on the radio but she’s not responding. Jim’s his normal negative self and the group seems ready for him to turn into a walker just so they don’t have to listen to him whine anymore. Morgan refuses to lead the group and June gets frustrated. 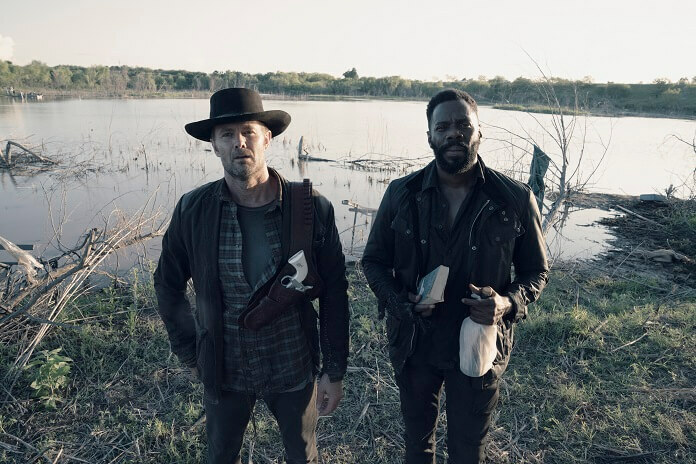 Charlie and Alicia call out to John (Garret Dillahunt) and Strand (Colman Domingo) who are stunned they’ve been found. Alicia’s all smiles as she looks across the flooded road, and then she too is stunned when she hears June’s voice calling out for Al over the radio. Alicia tells June she and Charlie have found John and Strand, and June is rendered speechless. Morgan takes over the radio, informing her he got the group stuck on the top of a hospital. Alicia promises she’s going to get John and Strand to safety and then she’ll mount a rescue. Morgan has a renewed sense of purpose and thinks he knows how to get off the roof. Meanwhile, John doesn’t think Charlie and Alicia are coming back. He doesn’t believe they can find a way to cross the river. Strand, however, is optimistic. Strand points out that Alicia seems to have forgiven Charlie since they’re out there working together, and that’s a good sign that anything is possible. Back at the hospital Jim stands on the edge of the roof and Morgan thinks he’s going to jump. He’s not. He’s on the edge so that he can piss on the walkers down below. Morgan explains they’re going to try to get to Al who’s trapped in the hospital. He needs Jim’s help but it doesn’t sound like he’s going to get it. Sarah wants Jim’s beer recipe, acknowledging that he’s a jerk but that his beer is exceptionally good. Jim admits his beer is what this world needs, but he doesn’t hand over the recipe. Alicia and Charlie look through the town for a boat. They find a canoe but fail to see an injured Martha (Tonya Pinkins) stumbling toward them. She fires a shot but fortunately it misses. Charlie and Alicia duck for cover as Martha rails against them for helping Morgan’s group. Alicia offers to help her, but Martha claims she doesn’t need help. She falls over in mid-sentence, unconscious, disproving her claim. Alicia and Charlie realize she’s the woman from the walkie talkie. 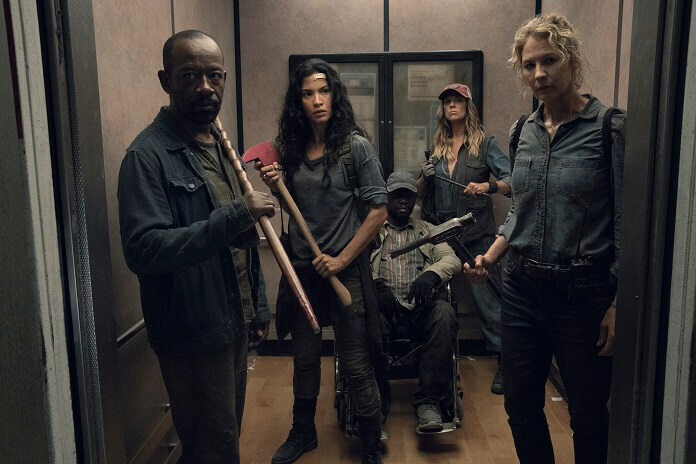 Morgan’s gang makes it down to Al’s floor in the elevator. The walkers seem to have disappeared and the group solidifies their plan to find Al and head back to the elevator. They discover part of the ceiling came down on the batch of walkers on that floor. They then discover other walkers who Al must have taken out. John and Strand hear something big heading their way and it turns out Alicia and Charlie have taken over Al’s van. They’re able to easily make it through the flooded road, and even the newly pessimistic John manages a smile. Martha’s in the back of the van, still unconscious. Back at the hospital, Morgan discovers another route to the freight elevator. Morgan tells his group to go, but he’s going to stay behind to create a distraction so they can escape. He believes he got them into this predicament and owes it to them to get them out of it. They reluctantly agree to leave him behind. Morgan makes it back up to the roof, dragging a walker. Jim makes a snide comment and Morgan tries to enlist him to help with the distraction. He declines, again. John calls for Morgan but June responds. John assures her he’s good now that he’s heard her voice, and he’s overcome with emotion. June smiles as they talk, explaining her situation. John lets June know they’re on their way. June’s group makes it to the street where walkers eagerly await their next meal right outside the hospital gate. Morgan radios them that he needs a minute to create the distraction. Morgan dangles the walker over the edge of the roof and then tosses him onto a vehicle parked below. The car alarm sounds and the walkers stumble off to check it out. He then radios his group to get going. June doesn’t want to leave without him, but he explains the power’s out and he can’t make it down. He confesses he has things to make up for and if he gets her back to John, that’s making up for something. The siren winds down and the walkers are right on the ambulance the group escapes into when June is forced to get inside the vehicle and leave with the group. It’s just Morgan and Jim now, and Jim thinks Morgan’s taken the easy way out by remaining behind. “Death is a certainty. Getting out from under the sh*t you’ve done isn’t,” says Jim. Jim asks Morgan to kill him before he turns. Morgan agrees, and then he and Jim hear a noise from down below. The gang’s returned and June radios they’re not leaving him behind. Morgan responds by telling them to get to safety. John speaks up and confirms to Morgan there’s no way he’s going to leave him high and dry. John explains he was trapped on an island by a massive alligator, drove there in a SWAT van, and stitched up a woman who tried to kill all his friends. “Seems like anything’s possible,” he says. Alicia’s next on the radio and she says she’s in position. They are all there ready to help, and Morgan can’t believe they’re risking their lives for him. June tells him that despite what he might believe, they need him. Morgan looks down on the street and discovers they’ve found a fire engine. It has a generator and they begin raising the ladder toward the roof. It’s short of the roof by a couple of stories, but Morgan spots a rope to lower himself down to another ledge. He tells Jim to join him, unwilling to leave him behind. Jim doesn’t want to go and finally Morgan apologizes. Jim doesn’t exactly accept it but does remind Morgan that by delaying his putting his friends in jeopardy. As Morgan makes it to the lower level a walker breaks through a glass door and attacks him. Fortunately, John’s able to shoot him from the ground. Alicia, Luciana, and June work on keeping the area clear of walkers during the rescue operation. The ladder’s still a fair distance away and Morgan’s forced to leap to it. He makes it and John calls for everyone to return to the vehicle. They make it to the roof of the fire truck and are soon surrounded by walkers. Sarah radios Wendell to make sure he’s okay inside the SWAT van. He is, but it’s also surrounded by walkers wanting in. It’s only a few feet away but the path to it isn’t clear. Morgan volunteers to hop down and create yet another distraction so everyone can return to the van. However, before he can sacrifice himself Jim radios that he’s got this. Jim has decided how he’s going to go. He gives Sarah his recipe before making his final move. He instructs her to put the walkie up to her ear so no one can hear the final ingredient, and she smiles when he reveals what it is. Jim walks to the edge of the roof and falls off. He lands on a car and the siren draws the walkers away. When the group open the back of the van, Martha’s disappeared. They don’t look for her and instead head out, reunited at last. Sarah wants to know what they should name the beer. They decide on Jimbo’s Beerbos, although they’re pretty sure Jim wouldn’t approve. June holds John’s hand and he smiles. She asks Morgan where they’re going and they discuss options. The hurricane left a lot of damage in its wake, so many of the nearby cities are out as potential temporary homes. Morgan says he told Jim about Virginia, just as he told the rest of the group. He wants them all to head there now together.